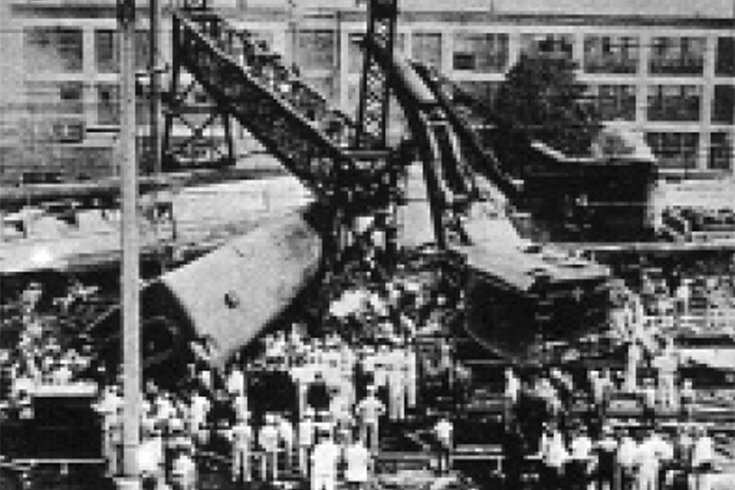 The devastating aftermath of the 1943 derailment of the Congressional Limited train at Frankford Junction in Philadelphia. Frankford Junction, the scene of Tuesday night's Amtrak train derailment that killed five people, was the scene 72 years ago of one of the deadliest rail disasters in U.S. history. On Sept. 6, 1943, the Pennsylvania Railroad's speediest train, the Congressional Limited, derailed and crashed at the railroad junction in Kensington, killing 79 people and injuring 117 others. Like Amtrak's train No. 188 that derailed Tuesday night in Port Richmond, the Congressional Limited traveled between Washington D.C. and New York City, with a typical stop in Newark, N.J. It covered the 236-mile trip in 3½ hours at speeds up to 80 mph, considered remarkable for the time. On that Labor Day Weekend in 1943, 16-car trains helped the company accommodate the expected high demand. At Union Station in Washington that Monday, 541 passengers boarded the 4 p.m. train, its cars hauled by PRR GG1 electric locomotive number 4930, scheduled to travel straight through to New York City's Pennsylvania Station. The train made it Philadelphia without incident - and ahead of schedule. Shortly after it passed through North Philadelphia station and slowed its speed, it beared down on the Shore signal tower at Pacific Street near Kensington Avenue. John P. Boyer was pulling his shift in the tower. The phone rang. It was A.J. Carlin, the clerk at the "C" switching yard, which was just over half a mile west of the tower. Carlin told Boyer that an engine man at the yard, Harold W. McClintoc, had seen smoke and flames shooting from beneath the seventh car when the Limited passed by. Boyer would later tell investigators that he reached for the warning signal but that before he could pull it, the train jumped the tracks at his feet. The seventh car, a crowded coach, went first, taking a second coach, two diners and two Pullmans with it. Impacting a signal gantry, the car's roof was peeled off along the line of windows "like a can of sardines." Car #8 wrapped itself around the gantry upright in a figure U. The next six cars were scattered at odd angles over the tracks, and the last two cars remained undamaged. The bodies of the 79 dead lie strewn over the tracks. All hospitals in the area were soon filled with dead and injured. Urgent appeals were sent out for blood donors and registered nurses. At the scene of the crash, the dead were removed one by one and placed beside the tracks until they were removed by stretcher-bearing civilian defense volunteers. Workers from a nearby shipyard brought their acetylene torches to the scene to cut open cars to reach the injured, a process that took until the following morning. The rescue work was directed by Mayor Bernard Samuel, with the last dead removed a a full 24 hours later. Frankford Junction is a railroad junction, and former junction station, situated between Kensington and Port Richmond. The 4-track Northeast Corridor line from Trenton connects with the 2-track Atlantic City Line from Atlantic City at the junction. It has been used for rail transportation since 1832 but has not served as a station since the 1990s.